Choose Customers → Create Estimates. 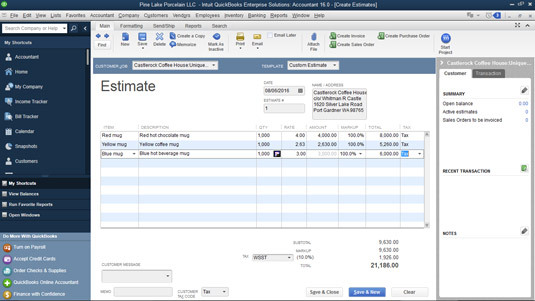 QuickBooks opens a Create Estimates form, which bears an uncanny resemblance to the Create Invoices form that you’ve seen if you’ve worked with QuickBooks at all. Choose the appropriate Customer:Job from the drop-down list at the top of the form. QuickBooks automatically fills in as much information as it can — usually at least the Name/Address text box — on the form. In the example, the job is “Unique Design for Grotto Shop,” the “Unique Design for Grotto Shop” being the fictional job your fictional retailing business had agreed to perform. If you configured QuickBooks to track classes, the appropriate drop-down list shows up in the top center of the form. Go ahead and use the box, if appropriate. Add the line items — details, details, details. You fill in the details of a Create Estimates window in the same way that you fill in the details of a Create Invoices window. One field that is unique to the Create Estimates window is Markup. The Markup field, which appears on some versions of the Create Estimates window, adds a specified percentage of the line item price total. Refer to the image above, where the markup percentages are specified as 100%, so the Amount column values get doubled in the Total column, or increased by 100%. However, if the specified markup equaled to 100 (and not 100%), the values shown in the Total column would all be $100 greater. The Markup field doesn’t appear on all versions of the Estimates template: only the Custom Estimate and Proposal templates. Each line item that you want to include on your job estimate needs to be described in the Items list. Note that because you often sell work to clients and customers by using, in part, an estimate, you’ll typically want to include full descriptions of the items. (Optional) Add any optional information. Use any of the other boxes available in the Create Estimates window to collect and store additional information. For example, just as with the Create Invoices window, you can click the Customer Message drop-down list and choose or write a friendly message. You can also use the Memo field to write a note to yourself regarding the job. Or maybe add some notes about the screenplay that you’ve been thinking about pitching to the studios. Whatever suits your fancy. If you want to include other items in the Create Estimates window, you can customize that window. Click the Formatting tab to show the Formatting ribbon and then click the Customize Data Layout button. QuickBooks displays a dialog box that you can use to control which bits of information appear on the estimate. Before you print that estimate, remember that information in the Create Estimates window isn’t the same information that appears on the written estimate. To see how the printed version looks, click the down arrow below the Print button in the Create Estimates window, and choose Preview from the drop-down list. The result is a full-page image, shrunk to fit onscreen. If you haven’t saved your estimate yet, go ahead and click either the Save & New button or the Save & Close button. To examine the estimate (or any onscreen QuickBooks form) more closely, either click the Zoom In button at the top of the Print Preview screen or move the mouse cursor over the image. When the cursor looks like a magnifying glass with a plus (+) sign in it, click the left mouse button. Because you can see only part of the preview this way, use the scroll bars at the bottom and right of the windows to move around to the different areas. Note that the magnifying glass now has a minus (–) sign in it, and the Zoom In button toggles to Zoom Out. If you complete more than one estimate, you can use the Prev Page and Next Page buttons on the Print Preview screen to look at other estimates. When you finish, click the Close button. If you haven’t used QuickBooks to print estimates before, you may need to set up your printer for this task first. To do so, choose File → Printer Setup and then choose Estimate from the Form Name drop-down list. Specify the printer settings that you want for printing estimates. (This process works the same way as it does for printing other forms, such as invoices.) Click OK when you’re done. The Print One Estimate dialog box that QuickBooks displays after you click Print in the Create Estimates window also works the same way as the Print One Invoice dialog box does.